Moles are yard pests that create tunnels and holes. The tunnels and holes are a hazard when you are walking in the yard, and the only way to improve the lawn is to get rid of the moles. If you don't want to put poison in your yard, you can employ some natural methods to treat the lawn and drive the moles out without endangering pets and children. Mix up a sprayer with water and beneficial garden nematodes. The quantity of water isn't exactly important as long as it is enough to spray the area where the grubs are in your lawn. The grubs are the reason that moles are in your yard. Killing them with the natural nematodes will take away the reason the moles have for being there. 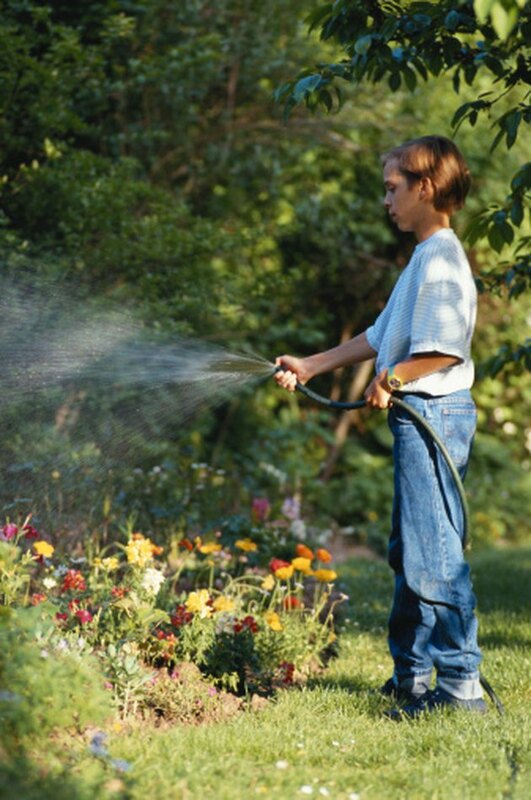 Water the lawn with a garden hose after you apply the nematodes. Keep the yard damp for several days to keep the nematodes active. Insert a garden hose down the mole tunnels and flood them with water. Repeat this with all the tunnels every day for several days to encourage the moles to move on to a new location. Pour castor oil in a spray container and spray the lawn. It won't hurt the grass and moles do not like it. Soak rags in bleach and put them in the tunnel openings. The smell will discourage the moles. Mothballs also cause an odor that they do not like.